The B-2 can respond from domestic US bases to conflicts anywhere in the world within hours. The B-2 is considered the most survivable aircraft ever built. The aerodynamic design of B-2 incorporated computational fluid dynamics (CFD). Flight testing has encompassed 100% of the air refuelling envelope with the KC-135 and KC-10 tankers. The Fire and Ice nose-art prominently displayed on a B-2. Northrop Grumman has delivered over 20 B-2's to the US Air Force. Its distinctive profile comes from the unique ‘flying wing’ construction. The leading edges of the wings are angled at 33° and the trailing edge has a double-W shape. It is manufactured at the Northrop Grumman facilities in Pico Rivera and Palmdale in California. The B-2, after ten years of service, finally achieved full operational capability in December 2003. In the first three years of service, the operational B-2s achieved a sortie reliability rate of 90%. An assessment published by the USAF showed that two B-2s armed with precision weaponry can do the job of 75 conventional aircraft. 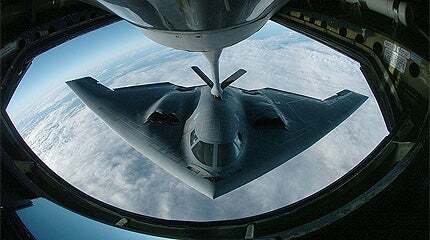 Northrop Grumman has developed a new radar-absorbent coating to preserve the B-2’s stealth characteristics while drastically reducing maintenance time. The new material, known as alternate high-frequency material (AHFM), is sprayed on by four independently controlled robots. In November 2011, the USAF awarded a $109m contract to Northrop Grumman for producing a redesigned aft deck for the B-2 stealth bomber. 21 B-2s have been delivered to Whiteman Air Force Base in Missouri, the first in December 1993. A new transportable hangar system has been developed which allows the B-2 to be deployed to forward locations overseas. The hangars are 126ft long, 250ft wide and 55ft high. The first of these hangars has been erected on Diego Garcia in the Indian Ocean. Prior to this development, B-2s had to return to Whiteman AFB after missions, for maintenance of the aircraft’s stealth features. The B-2 was thus deployed for the first time during Operation Iraqi Freedom in March / April 2003. In March 2005, a B-2 squadron was deployed for the first time to Andersen Air Force Base in Guam in support of the USAF Pacific Command. On 23 February 2008, a B-2 crashed shortly after take-off from Andersen AFB in Guam, the first crash in the aircraft’s history. The two pilots ejected safely from the aircraft, which was not carrying munitions. A USAF investigation into the causes of the crash is underway. The B-2 fleet was grounded pending the results of the investigation but was returned to service in April 2008. A USAF investigation released an accident report in June 2008 which concluded that the crash was caused by moisture in the port transducer units. These sensors sent distorted information to the air data system. Northrop Grumman, the B-2’s prime contractor, leads an industry team that is working on modernising the B-2. This is done to ensure that craft remains fully mission capable against evolving worldwide threats. A range of upgrade programmes are working on improving the B-2’s lethality; its ability to receive updated target information during a mission, and its ability to collect, process and disseminate battlefield information with joint force commanders or other local first responders worldwide. In June 2007, Northrop Grumman was awarded a contract to develop an EHF satellite communications capability and computer architecture upgrade for the B-2. The upgrade includes a Lockheed Martin integrated processing unit (IPU). Flight testing with the new systems was completed in July 2009. US Air Force and Northrop Grumman Corporation completed the system design review of the new software and computing architecture during July 2008. The new architecture allows the B-2’s new integrated processing unit (IPU) to communicate with the aircraft’s processing applications. This new architecture provides high-speed data handling environment required to implement future B-2 capabilities such as an EHF satellite communications system, and also provides B-2 the ability to destroy moving targets. The cockpit accommodates two crew. It is equipped with a colour, nine-tube, electronic flight instrumentation system (EFIS), which displays flight, engine and sensor data and avionics systems and weapons status. The pilot can choose to activate the appropriate selection of flight and mission equipment for take-off mode, go-to-war mode and landing mode by using a simple three-way switch. The aircraft carries all its weapons internally and is fitted with two separate weapons bays in the centre of the aircraft. The B-2 has the capacity to carry up to 40,000lb of weapons, including conventional and nuclear weapons, precision-guided munitions, gravity bombs and a range of maritime weapons. Each weapons bay is equipped with a rotary launcher and two bomb-rack assemblies. In tests, the B-2 successfully released B-61 and B-83 nuclear and mk84 conventional bombs from the rotary rocket launcher, and mk82 and CBU-87 conventional weapons from the bomb racks. The B61-11 is an earth-penetrating nuclear bomb for use against deeply buried and hardened targets. The B83 is a strategic free-fall nuclear bomb. The B-2 can also carry the AGM-129 advanced cruise missile, which is a strategic cruise missile with a range estimated at up to 1,500 miles. 16 satellite-guided JDAM (joint direct attack munition) missiles can be carried. Northrop Grumman is converting the B-2 bomb rack assembly to a new ‘smart’ configuration, which will increase the number of JDAMs which can be carried to a maximum of 80. The aircraft will also be fitted with the joint stand-off weapon (JSOW), joint air-to-surface stand-off missiles (JASSM) and the wind-compensated munitions dispenser (WCMD) and will be able to carry up to 80 115kg small diameter bombs (SDB). In June 2007, Northrop Grumman was awarded a contract to integrate the Boeing massive ordnance penetrator (MOP) weapon on the B-2. The MOP is GPS-guided, contains 2,400kg (5,300lb) of explosive and is designed to penetrate hardened, deeply buried targets. B-2 is capable of carrying two MOP weapons, one in each weapons bay. A generic weapons interface system (GWIS) has been fitted as part of the block 30 upgrade. The GWIS is an integrated digital software package, which allows the B-2 to carry different mixes of stand-off weapons and direct attack munitions on a single sortie, enabling the aircraft to attack up to four different types of targets on a single mission. Under a contract awarded to Northrop Grumman in February 2008, the USAF has begun a programme to give the B-2 the capability to attack moving targets, using precision-guided weapons such as the small diameter bomb II. The contract involves the upgrade of displays and radar modes. The B-2 carries a Lockheed Martin radar warning receiver, a Northrop Grumman defensive aids system and the Lockheed Martin AN/APR-50 defensive management system (DMS). The Raytheon AN/APQ-181 covert strike radar, operating at J band (Ku band), is a multi-purpose radar with terrain following and terrain avoidance modes. Testing at Edwards Air Force Base has demonstrated reliable terrain following at altitudes down to 200ft. In April, 2009 Northrop Grumman Corporation delivered to the US Air Force the first operational B-2 Spirit stealth bomber to be equipped with newly modernised radar. The aircraft was officially handed off to the air force on at Whiteman Air Force Base, the operational home of the B-2 fleet and the 509th Bomb Wing. The updated aircraft will be used by air force to conduct additional field testing of the radar, and the data gathered from these decisions will support future fielding decisions. The B-2 radar modernisation programme replaces the aircraft’s original radar system with one that incorporates technology improvements that have occurred since the B-2 was originally designed in the early 1980s. In November 2002, Raytheon was awarded a contract to develop a new Ku-band AESA (active electronically scanned array) antenna for the B-2 radar to avoid interference with commercial satellite systems after 2007. Flight tests with new radar began in October 2007 and continued until 2008. Installation of the new antenna on the B-2 fleet is to be completed by 2012. The B-2’s navigation suite includes a Rockwell Collins TCN-250 tactical air navigation system (TACAN) and a VIR-130A instrument landing system. The communications equipment is supplied by Rockwell Collins. A Milstar military strategic and tactical relay satellite communications system is installed in block 30 aircraft. The aircraft have been upgraded with Link 16 communications link. The aircraft is powered by four General Electric F118-GE-100 turbofan engines internally mounted in the body of the wings. The engines have an exhaust temperature control system to minimise thermal signature. The engines, rated at 77kN, provide a high subsonic speed and a maximum gross take-off weight of 336,500lb. In-flight refuelling gear is installed in the top centre line of the aircraft behind the cockpit.